The crabs: There are 2 types of salted crabs you can get at Asian markets; whole salted crabs and salted crabs in sweet chili sauce. Both are available in the frozen section. My first choice is the whole salted crabs because there are no added sugar or seasonings. However, you’ll need to pull the crab apart into pieces and clean out the gills and claws. 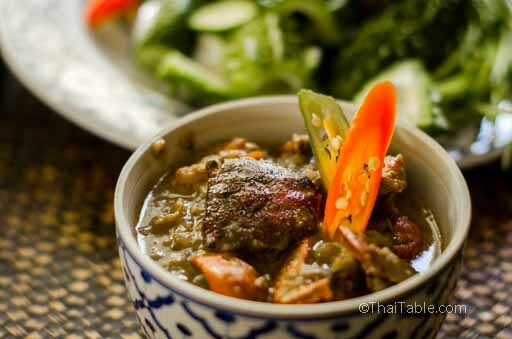 The other type of salted crabs that are available in my area is the salted crab in sweet chili sauce which I use for this recipe. The crabs are already gutted, cut into pieces and preserved in a sweet and spicy sauce. 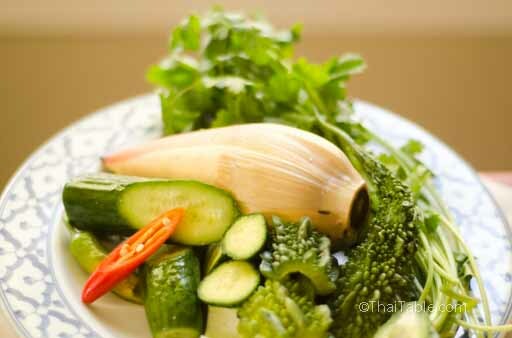 I rinse out the sugar and chili before using for this recipe. If you use this type of crabs, you may want to taste the sauce before adding sugar. Use coconut cream instead of coconut milk to get the thick texture. I use serrano peppers in this recipe. 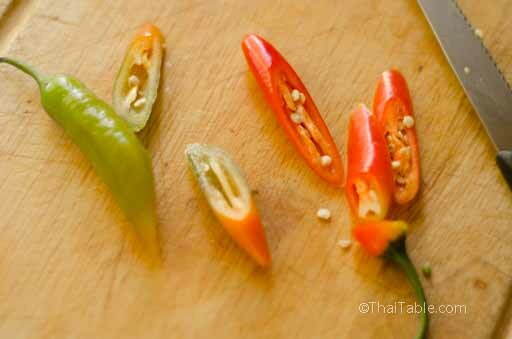 You can also use the small Thai chili peppers; use them whole for non-spicy sauce and cut them up for a super spicy sauce. Wax peppers or banana peppers will work well for a mild sauce, too. Add a small amount of water, if the sauce gets too thick. Again follow the measurement loosely and trust that you tongue knows what you like. Add or take away as you see fit. Lohn is a type of dish that you should cook without a recipe; all you need to know is the ingredients. Let your tongue guide you in the amounts that you need to add to make a tasty dish. A good Lohn is creamy and salty with a hint of sweet and sour. 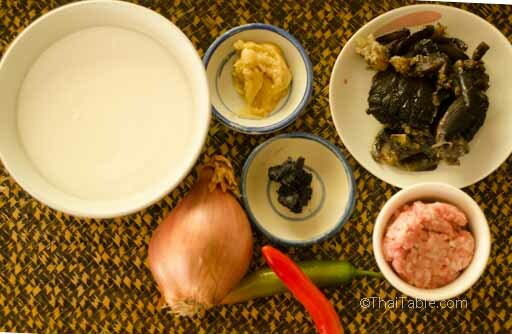 It can be spicy if you choose to add chili peppers or it can be a creamy dipping sauce. 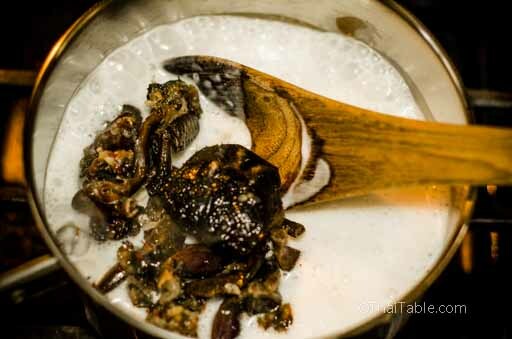 Add ¼ cup of warm water to tamarind paste and mix well to break up the paste. Let the mixture sit for a few minutes to dissolve. For a quick paste, dissolve it in a microwave for a minute or so. If you’re using a commercially available thinner tamarind paste, no need to dilute it. 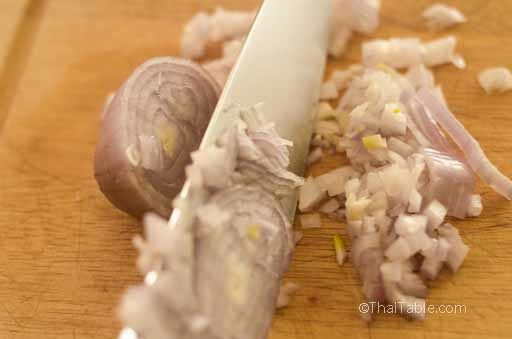 Chop or slice shallots. Rinse the salted crabs well. If you get the whole crab as opposed to pieces, pull the crab apart and remove the gills and claws. Spoon out the meat to empty the shell. 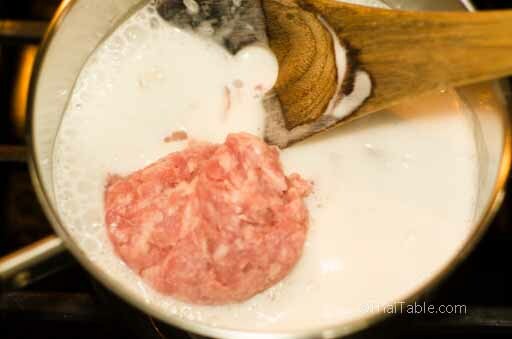 Over medium to low heat, add coconut milk to a pot. Let it simmer. Add shallots, ground pork and salted crabs. Stir to mix everything in. The sauce should be light brown. The more crabs you add the darker the sauce is. Let the sauce boil until the crabs start to turn reddish. Add half of the sugar and tamarind. If your tamarind is super dark, the sauce will be dark. Once when the sauce boils again, take a taste. It should be slightly sweet and sour. The longer you boil the salt will come out from the crabs. Add sliced peppers if you like it spicy, otherwise, use the peppers for garnish only. 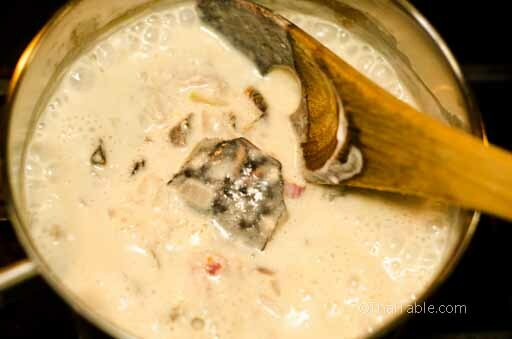 The sauce should be somewhat thick from reducing coconut milk and dissolving onion. It should taste creamy, salty, sweet and sour. Accompanying fresh vegetables (picture 8): cucumber, Thai eggplants, banana flowers, white turmeric, cilantro, winged beans, green beans, cabbage and almost any greens in your fridge or garden. Serve with rice and fresh vegetables.